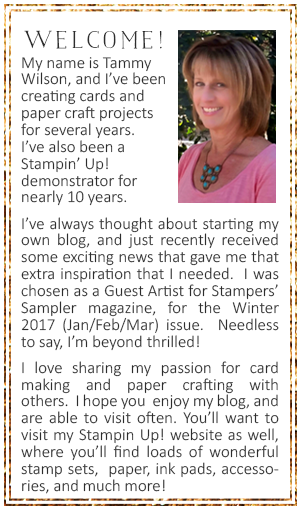 I just love mixing patterned paper on my projects, and this card is no expection! On my Whisper White Thick Cardstock base, I layered a couple of strips of the Festive Farmhouse Designer Series Paper, along with a strip of Under the Mistletoe Designer Series Paper. Using the one of the Stitched Shapes Framelits, I diecut a circle from Crumb Cake Cardstock and then added some texture with the Corrugated Textured Impressions Embossing Folder. I used pine tree from the In the Woods stamp set, stamped it with my Old Olive Classic Stampin’ Pad, and diecut it with the matching In the Woods Framelit. I stamped the sentiment (from the Hearts Come Home set) with my Cherry Cobbler Classic Stampin’ Pad on Whisper White Cardstock, cut it out, speckled it with my Crumb Cake Stampin’ Write Marker, and popped it up with a few Stampin’ Dimensionals. Underneath the sentiment, I also tucked in a bit of Festive Farmhouse Cotton Twine. For a bit of holiday sparkle, I sprinkled on a few stars that I punched out from Sparkle Glimmer Paper, using the Twinkle Builder Punch. TIP: You can add extra texture and interest to your diecut shapes by using one of the Textured Impressions Embossing Folders. It’s a easy way to take your project to the next level! 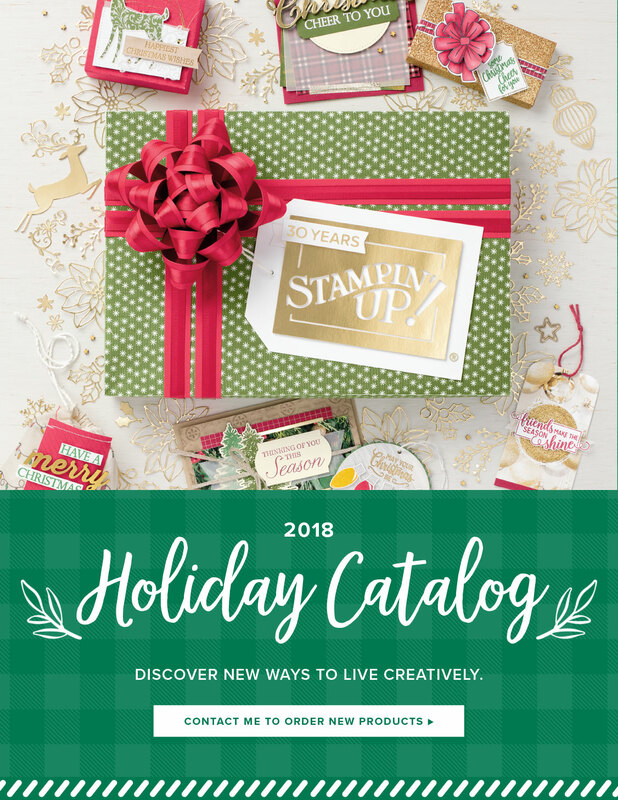 The Stampin’ Up 2018 Holiday Catalog, as well as the 2018-2019 Stampin’ Up Annual Catalog are both chockful of so many wonderful products! 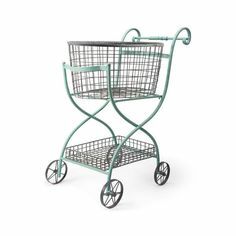 Okay, let’s be honest…..they are absolutely overflowing with some of the most amazing products ever! Don’t miss out on the limited time specials below, and take advantage of a 10% discount on some of your favorite products! Watch the videos below and get your creative juices flowing!